After a relatively uneventful journey and a short stay in Wooster, we’ve made it to Dickinson College in Carlisle, Pennsylvania. We’re spending the week analyzing our samples on Dickinson’s X-Ray Fluorescence Spectrometer (XRF) and X-Ray Diffractometer (XRD). First, we need to turn our rocks into powder. 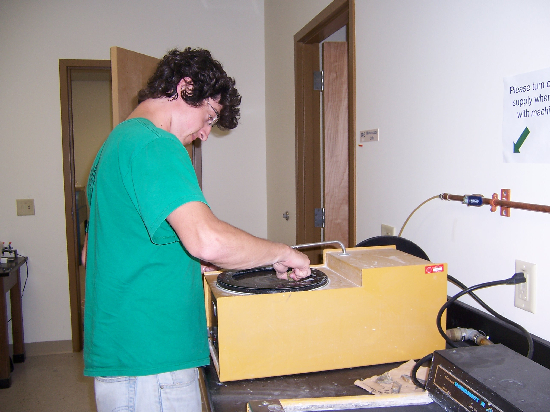 We typically begin by cutting down the sample on a rock saw. 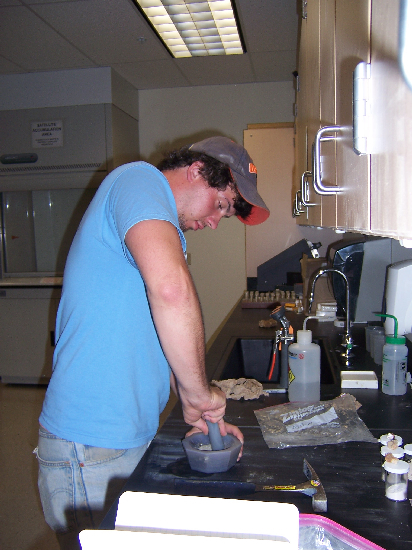 Adam slicing some of his rhyolites. It's a dirty job. Then we grind the smaller pieces to get rid of any contamination introduced by the saw. Adam grinding. It's a cleaner job. 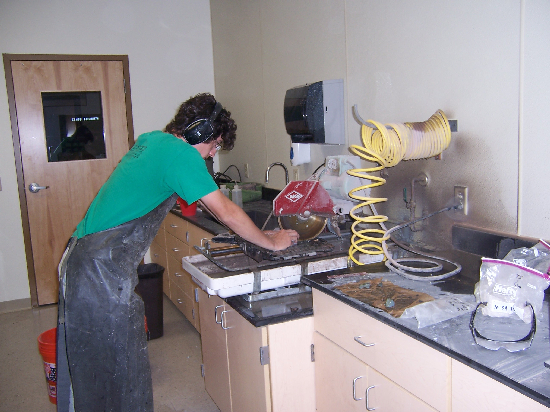 The samples get cleaned in a sonicator. Todd cleaning his pillow basalts. And the clean samples get set out to dry. Todd's glasses drying on the lab bench. 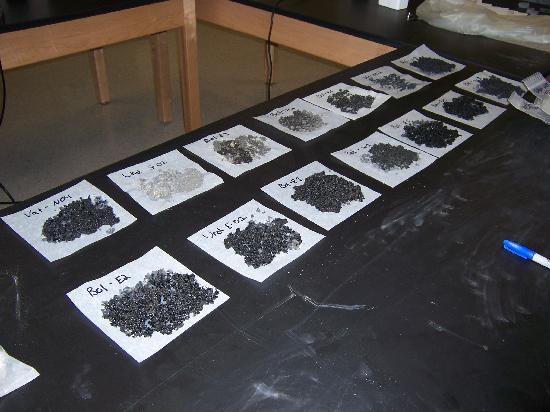 Finally, the samples can be crushed. We can crush them in a shatterbox or by hand using an agate mortar and pestle. 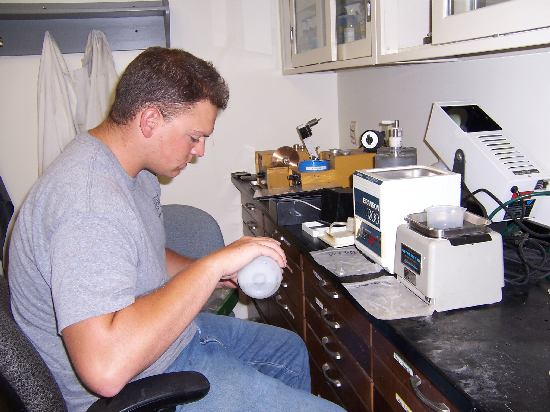 Rob powdering his zeolites by hand. 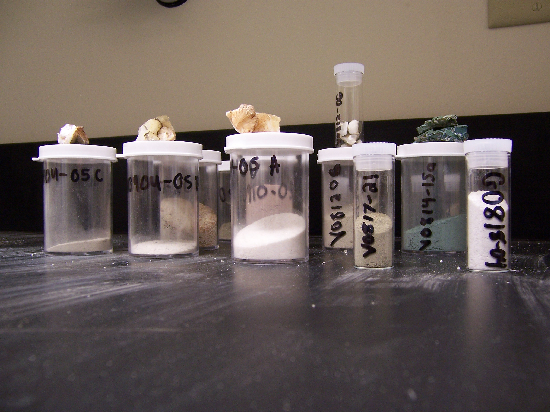 Pretty rock powders in neat little vials.